In honor of Touchdown Jesus, TIME takes a look at other ridiculously huge monuments worldwide. 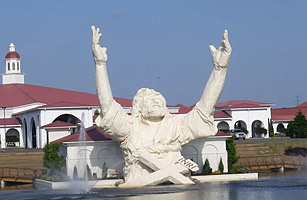 In 2004, the Solid Rock Church erected a 62-foot statue of Jesus lifting his arms into the air, which they named the King of Kings statue. Travelers on Ohio's Interstate 75 dubbed the figure Touchdown Jesus because of the resemblance to a referee signaling a football score (it was also dubbed "Big Butter Jesus" in a song by comedian Heywood Banks). On June 14, Touchdown Jesus was struck by lightning, and the Styrofoam and fiberglass statue burned to the ground.